Hearing impairment and relevant problems have prevailed as the second most prevalent health problems over the years. Bacterial or viral infections, aging, trauma, noise, and genetic factors have been major reasons for hearing problems. The Centers for Disease Control and Prevention (CDC), has estimated over 10% of the population in Europe to be suffering from hearing impairment. Prevalence of hearing impairment has also been surging in developing countries such as China and India. A complete implementation of Bluetooth standard needs greater power supply than that capable of being generated within small footprint of the hearing aid’s battery. However manufacturers of Bluetooth hearing aids have long ago come up with an intelligent solution to access this prevalent wireless standard. Hearing aids, with the help of compatible assistive listening devices, generally called streamers, can offer the communication between wireless technology of hearing aids and Bluetooth-enabled devices. Personalized listening experience has been one of the major benefits of Bluetooth hearing aids, which has driven their adoption among hearing impaired patients over the past few years. Audio signal can be usually set to stream to multiple hearing aids, with the streamlined signal being amplified and shaped for matching the personalized settings of the hearing aid. Based on the manufacturer’s design, volume of a stream is capable of being controlled through the Bluetooth hearing aids. Bluetooth hearing aids nowadays also are integrated with capabilities to remotely change programs or volume from the streamer. This comes in handy particularly when the hearing aids are too compact to accommodate external controls. Bluetooth has become a standard protocol of the electronics industry. The already tested and refined platform of Bluetooth facilitates its adoption in hearing aids, and complements cost-effective production. 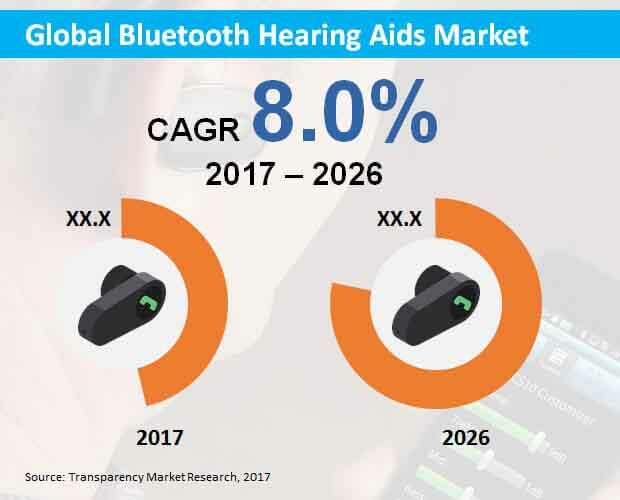 According to Transparency Market Research, global market for Bluetooth hearing aids is slated to exhibit an impressive growth between the period 2017 and 2026. Sales of Bluetooth hearing aids across the globe are forecast to surpass US$ 850 Mn in revenues by 2026-end. In North America, over 10% of the population is affected from hearing impairment, and the percentage is increasing, even among the youth population. In the U.S., hearing-impaired individuals typically pay for hearing aids themselves, as the nation has limited margin for public hearing healthcare system. The conditions in Canada however vary from one province to another. These instances significantly create opportunity for penetration of Bluetooth hearing aids in North America. The region is projected to remain dominant in the global Bluetooth hearing aids market, in terms of revenues. Bluetooth hearing aids are expected to witness the largest demand from adult patients. This is mainly because of the rapidly growing geriatric population across the globe, wherein prevalence of hearing impairment is ever relatively higher. Demand for Bluetooth hearing aids by pediatric patients will remain comparatively lower than that by adult patients during the forecast period. Based on product type, behind-the-ear (BTE) hearing aids and in-the-ear (ITE) hearing aids are expected to be the most remunerative in the global Bluetooth hearing aids market through the forecast period. This is mainly because of growing implementation of miniature technology in Bluetooth hearing aids, along with product customization provisions. Miniature technology facilitates comfortable fitting of Bluetooth hearing aids, enabling hearing-impaired patients to lead a normal life. Hospitals and clinics will continue to be the leading end-users in the global Bluetooth hearing aids market, in terms of revenues. Sales of Bluetooth hearing aids to individuals and in hospitals will exhibit equal CAGRs through 2026. Key market players, as identified by the TMR’s report on the global Bluetooth hearing aids market, include Sivantos Pte. Ltd., Sonova Holding AG, Cochlear, MED-EL, Beltone, Miracle Hearing Aid Clinic, Persona, Union Hearing Aid Centre, Eartone, Siemens Healthcare, Shenzhen Sunsky Technology, Starkey Hearing Aids, GN ReSound, Medtechnica Orthophone, William Demant Holding A/S, GN Store Nord A/S, and Widex A/S. Bluetooth hearing aids have gained immense traction across the globe, as they present the hearing impaired with the latest technology for using devices such as mobile phones and MP3 players. Currently available digital Bluetooth hearing aids render it possible in wirelessly streaming and connecting with other electronic devices integrated with Bluetooth. These devices have gained paramount importance among the hearing impaired, enabling them to utilize phones, tablets, televisions and music players. A new Transparency Market Research report inspects the global market for Bluetooth hearing aids for the period between 2017 and 2026. The report supports its readers by accumulating and slating all possible strategies with regard to valuable insights for maintaining a proper tempo with changing market dynamics at present and in the near future. The report presents in-depth information associated with the market size, opportunities for the market growth, and trends, restraints & drivers of the market expansion. The report is well-structured and maintains a good flow, providing understanding on all aspects of the Bluetooth hearing aids market. Recommendations and analysis of TMR on the global Bluetooth hearing aids market is an additional benefit offered by the report. An executive summary of the market is delivered in the report’s first chapter, which incorporates insights and forecasts on all the market segments included. Market number such as CAGRs, and revenues for the historical (2012-2016) & forecast (2017-2026) period have been rendered in this chapter. An overview of the global Bluetooth hearing aids market has been provided following the executive summary. The overview imparts an incisive introduction of the market, with a formal definition of “Bluetooth hearing aids” trailing the market introduction. This chapter comprises intelligence related to the market viewpoint of Bluetooth hearing aids, along with macroeconomic factors influencing the market expansion. This chapter clearly portrays the global Bluetooth hearing aids market’s wide scope to the report readers. Subsequently, the report issues chapters on the global Bluetooth hearing aids market’s segmentation analysis. Insights and forecasts with respect to the market segments namely, product type, patient type, end-user, and region, have been comprehensively delivered in these chapters. The segmentation analysis of the global Bluetooth hearing aids market engulfs indispensable market numbers such as the market share comparison, Y-o-Y growth comparison and revenue comparison. Succeeding chapters in the report propound insights and analyses on the regional segments included in the report viz., North America, Europe, Asia-Pacific excluding Japan, Latin America, Japan, and Middle East & Africa. The report has engulfed a chapter on the global Bluetooth hearing aids market’s competitive landscape, which provides detailed analysis and insights on companies offering Bluetooth hearing aids. Profiles of key companies, along with a strategic overview of their M&A and expansion plans across geographies, have been delivered in this chapter. This chapter is priceless for report readers, as its enables them in gauging their growth potential in the market and implement key strategies for extending their market reach. This chapter offers key recommendations for both new and existing market participants, enabling them to emerge sustainably and profitably. Intelligence on the market players has been delivered on the basis of their product overview, SWOT analysis, key developments, key financials and company overview. Occupancy of these market participants has been tracked by the report and portrayed via an intensity map.